PIGAFETTA -Filippo Pigafetta-De Bry Map of Africa. PIGAFETTA, F. / DE BRY - Filippo Pigafetta-De Bry Map of Africa. Title : Filippo Pigafetta-De Bry Map of Africa..
Map maker : PIGAFETTA, F. / DE BRY. Size : 21.5 x 15.7 inches. / 54.5 x 40.0 cm. 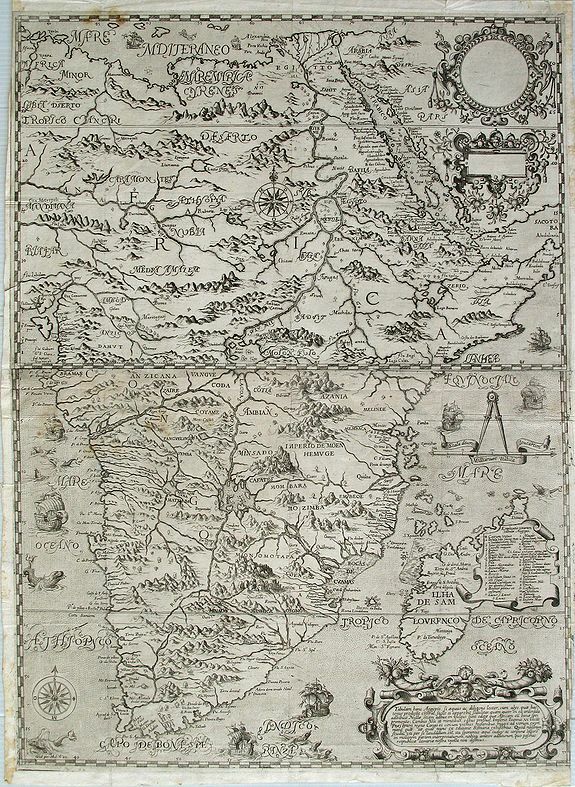 Description : This is the De Bry version of the Pigafetta map of Africa. It is a close copy of the Pigafetta map. Pigafetta wrote a book entitled Relatione del reame di Congo et delle circonvicine... published in Rome by Bartolomeo Grassi in 1591. From 1578 to 1584, a Portuguese explorer, Duarte Lopes, journeyed through the Kingdom of the Congo recording detailed information on his travels. At the conclusion of his travels, the ruler of the Congo sent Lopes back to Europe on a mission to re port to the King, Phillip II, and to the Pope on the affairs of the Congo. During his time in Rome from 1588-1589, Lopes came into contact with Filippo Pigafetta. A Dutch edition was published in 1596. This was followed by an English edition in 1597. There was also a German translation in 1597 by the De Bry brothers as a first part of their series, Petits Voyages. There was also a Latin edition in 1598. This map appears to be from the Latin edition of 1598. There is a detailed alphabetic key and decorative descriptive cartouche at the lower right. There are two further cartouches that are both blank in upper right corner of upper sheet. Concerning the cartography of Africa, there are two reasons why this map of Africa is significant. Firstly, Pigafetta rejects the long-held Ptolemaic belief of the Mountains of the Moon as the source for the Nile River, and secondly, he rejects the Nile as flowing north from two side-by- side lakes in central Africa. In his depiction, there are two lakes in central Africa, one above the other. The lower lake feeds the Rio deManhic e (Zambezi) and the Lorenzo Marches (Limpopo), and the northern one feeds the Nile, with a river connecting the two lakes. Also, the northern lake is placed above the Equator; Ptolemy placed the lakes further to the south. Pigafetta does locate another lake to the west as a source for the Congo and other rivers flowing east, a theme first introduced by Waldseemüller. The map became an important source on central Africa and the Congo, and was frequently used by later writers and mapmakers. Betz, p. 35-36. Schilder, vol VII p. 188. Not in Norwich. Condition : Fine condition overall. The two map sheets are joined for framing. Cut close to the neatline as customary for these maps.